Over the past 90 years and through three generations we have served the various real estate needs of the Volusia and Flagler County market area. Building on a family tradition begun in 1924, our goal is to provide the highest quality of services for our clients. Today we specialize in the valuation of commercial, industrial, acreage and development properties. We are a professional real estate appraisal and consulting firm serving the East Central Florida area. 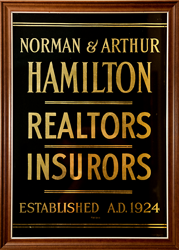 Through three generations since 1924, the Hamilton name has stood for honesty, integrity, and quality in the local real estate market. Sixty years ago the focus turned to real estate appraising and consulting services, incorporating these same principles and ideals. Our principal has 35+ years of commercial real estate appraisal experience. We incorporate time honored ethics, high appraisal standards, local expertise and current technology to provide professional services that are relevant in today’s market. We have been honored to serve our clients with high quality valuation services during our many years, and we pledge to continue in that long tradition in the years to come. Chip has been appraising real property in Florida for over 35 years. While he has appraised properties in over one-third of the Counties in the State, for the past 15 years most of his appraisal work has been in the Volusia/Flagler market area. While much of his work has been for financial institutions, a large percentage is for individual investors and corporations, developers and governmental agencies. He is approved by the State of Florida to provide appraisal services required for State acquisition and disposition projects and State and State-administered federal grants to county and local municipalities. He has provided appraisal expert witness testimony in County, State and Federal courts, and before Special Masters in county tax appeals. Chip has been active in the local community through his membership in the Daytona Beach West Rotary Club. Click here to send him an email, or click here to review his professional qualifications and state licensing information.